Rhino horn is more precious than gold on the black market, and our insatiable demand for the stuff has driven rhinos to the brink of extinction. 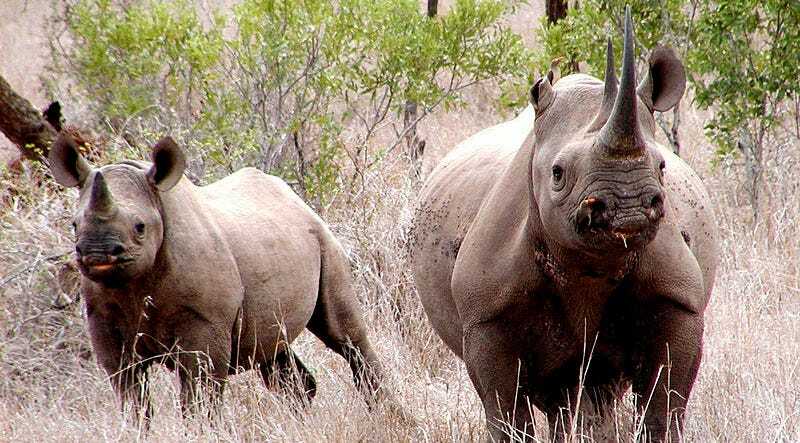 Now a Seattle-based startup has a radical plan to save these incredible animals: Using synthetic biology to manufacture rhino horns in the lab. The biotech company Pembient says it can 3D-print a synthetic rhino horn that’s biologically indistinguishable from the natural product (and perhaps even better). Prominent conservation groups, however, question the very premise of the idea, arguing that artificial horn will add legitimacy to an illegal and misguided trade, and ultimately increase consumer demand. How did we even get to this point? To answer that question, we need to take a quick trip to South Africa, home of the world’s largest rhino populations, and the scene of a horrific poaching crisis. Our fascination with rhino horn traces back centuries, to traditional medicine systems in China, Malaysia, South Korea, and India. In ancient Chinese medicine, rhino horn is used to treat a wide range of ailments, including fever, rheumatism, gout, snakebites, headaches, and (personal fav, if I had to pick one) ‘devil possession.’ In recent years, powdered rhino horn has been popularized as a hangover remedy, an aphrodisiac, and even a cancer cure. It’s none of these things: All of these claims are a load of unscientific malarkey. Rhino horns are made of keratin—the same harmless and medicinally useless substance found in your fingernails and hair. Yet many people still believe the horns possess magical healing powers. Worse still, in recent years rhino horn has become an status symbol—and that’s why the animals are now being slaughtered en masse. South Africa is home to the world’s largest population of rhinos—nearly 80 percent of Africa’s remaining 25,000—including the vast majority of southern white rhinos. The trouble started in 2008, when 83 rhinos were killed in South Africa for their horns—a notable uptick over the 10-13 animals killed in the years prior. In 2009, the death toll climbed to 122. Then 333 in 2010. It’s been growing steadily ever since. Last year, a record breaking 1215 rhinos were killed in South Africa alone—on average, a rhino every 8 hours. As of this April, South Africa was on track to meet, if not exceed, that number. Why the recent surge in poaching? In a word, money. There’s a growing upper class in both Vietnam and China, and that demographic seems willing to pay top-dollar for the luxury item. Combine this with the expansion of trafficking routes via the dark web, and we’ve got ourselves a recipe for a burgeoning illegal trade. Today, a kilo of rhino horn can fetch as much as 100 thousand dollars on the black market, according to The Guardian. If a rising consumer demand wasn’t enough, there’s another problem: The shifting demographic of the poachers themselves. Lone hunters looking to score a single, big payoff are no longer the issue. They’ve been replaced by large, shadowy networks of organized criminals; groups that are accustomed to trafficking everything from narcotics to women and children. Unfortunately, these poachers are smarter: Instead of killing with noisy guns, South African wildlife vets are now seeing poachers quietly darting rhinos with powerful anesthetics. Unsurprisingly, this is making their atrocities harder than ever to catch. To sum up, the situation is really, really bad. That’s why groups around the world have been floating all sorts of crazy ideas, from lacing rhino horns with poison to dehorning rhinos humanely to literally farming the animals for their horn. But few ideas have stirred as much excitement and controversy as the possibility of synthetically concocting a substance that’s chemically indistinguishable from the real deal. Rhino horn is principally composed of keratin, the same proteinaceous compound found in your fingernails. But creating a foolproof faux-rhino horn is a tad more complicated than collecting a bunch of human fingernails and grinding them up. Keratin, like all other proteins, is composed of a precise sequence of amino acids—and that sequence changes from animal to animal, from horn to nails to hair. Relatively simple spectroscopic analyses could be used to distinguish rhino keratin from a fake. Which is why Pembient, the biotech company launched by Matthew Markus and George Bonaci in January, is hoping to produce something as close to the real thing as possible using synthetic biology. (So far, the company has been using wool keratin to produce synthetic prototype horns.) This entails inserting the genes that encode rhino keratin proteins into yeast cells, and turning those microbes into miniature rhino keratin factories. Plugging new genes into yeast to express useful products is standard fare in the biotech world these days—it’s how we make a antibiotics, pharmaceuticals and enzymes. For Pembient, the challenge right now is honing in on the specific genes that actually produce rhino horn keratin. To do so, the company is currently mining the genome of the southern white rhino, The Guardian reported recently. Once the gene or genes are successfully identified and inserted into yeast, there’s the additional challenge of getting the bugs to express the protein, and purifying industrially scaleable amounts of it. Pembient has spent the last few months bunked up at the San Francisco biotech incubator Indie Bio, which is providing seed funding and lab space to foster this initial R&D. Beyond keratin, rhino horn contains a number of additional trace elements, including sulfur, calcium and potassium. If these chemicals aren’t included as well, simple elemental analyses could root out a fake substance. And lastly, since we’re talking about a biological product, there’s the matter of DNA. For a few hundred bucks, someone could submit a sample of rhino horn to a lab for DNA sequencing and determine tell whether the material bears the telltale signatures of a rhino. To fool the most thorough and scientific of wildlife product traders, Pembient might copy and amplify fragments of DNA from actual rhinos, or synthesize rhino DNA de novo in the lab. Once all the components — keratin, trace elements, and DNA — are ready, Pembient says it’ll mix the ingredients into a powder. The powder could be sold as is (that’s how most rhino horn consumers purchase the stuff, anyway), or it could be fed as ‘ink’ into a 3D printer. Pembient has already played around with this idea, making some prototype 3D printed horns using wool keratin, and the company believes it could print entire horns out of its synthetic rhino concoction. If all goes according to plan, Pembient could soon have itself a product that’s practically indistinguishable from real rhino horn. The one difference, in the company’s mind, would be contamination. Natural horn contains trace amounts of industrial pollutants, pesticides, even radioactive compounds that make their way into the environment following nuclear tests. Lab-grown horn, by comparison, would be clean—which might even make it a more favorable alternative to some. But the question remains of whether we should really be doing this at all. If We Can Make Synthetic Horn, Should We? Conservation groups don’t agree. The World Wildlife Fund monitoring network TRAFFIC recently told Motherboard that increasing supply would only exacerbate the problem by opening up the market even further. This is a legitimate concern. If, as Pembient hopes, synthetic horn can be produced and sold for a fraction the cost of real rhino horn, it would make the commodity accessible to a larger swath of potential consumers, while legitimizing the idea of the product. What’s more, having a fake alternative out there could elevate the status of real horn in the minds of the wealthiest buyers. TRAFFIC research has shown that alternative products—most notably water buffalo horn—already dominate the market, but that the richest consumers are nevertheless searching, and finding, bonafide rhino horn. Markus disagrees with these arguments on the basis of market research conducted in Vietnam earlier this year: Of 500 survey respondents who use rhino horn for medicinal purposes, 45% said they would use manufactured horn as a substitute. What’s more, Markus told Motherboard last winter that his team will be monitoring the market closely and is willing to cut off production if it seems the synthetic product is doing more harm than good. Many conservationists, Fowlds included, believe that educational campaigns and demand reduction are the only long-term solution to the poaching crisis. But as Pembient sees it, these sorts of ‘long-term’ efforts are exactly what haven’t been working — at least, not in a timeframe that’s compatible with saving the very last rhinos from extinction. The reason we’re even discussing synthetic rhino horn? Because something has to be done, and fast. At the end of the day, that might be the most important argument of all.